You know that feeling you sometimes get late at night after a busy day when you’re too tired to get up off the couch to even go to bed? When you finally decide to get up, you let the dog outside one last time before heading off to get a good night’s sleep—yep, that’s probably when it’s going to happen! It’s something most dogs owners think about but figure will never happen, right? I found out Saturday night that when your dog gets sprayed by a skunk, it’s worse than what you imagine. Skunk spray smells different (and SO much worse) than the occasional skunk road kill you pass when driving. It’s not a good time to make a 30 minute trip to the store for supplies to handle the situation. I had previously taken some notes about what to do when dog meets skunk, so after frantically searching my hard drive for the information, I was relieved to realize we had all the necessary supplies on hand. First, make sure to call your vet if your dog was bitten or injured by the skunk. If there are no injuries, you’ll want to act quickly while your dog is still wet. If the spray dries on the dog’s fur, the odor is much harder to remove and can last for months. If at all possible, do the following steps outside to avoid getting any skunk oil inside your home. If you must bring your dog inside, head directly to the tub or shower. Don’t hose your dog down with water right away which can spread the oily substance over your dog’s coat. If you can see the skunk spray on your dog’s coat, use paper towels to remove the excess oil, being careful not to spread it around. Gently rinse you dog’s eyes with saline solution if he’s been sprayed in the eyes. In an open container, mix hydrogen peroxide, baking soda and dish soap. Never mix or shake these ingredients in a covered container as they produce a chemical reaction when combined. Massage the solution into the areas of fur that got sprayed. Use the solution on a old washcloth if you need to apply it to your dog’s face (avoid his eyes, nose and mouth). Let the mixture sit for 5 minutes, then rinse. Repeat with additional batches of the mixture if necessary, until the dog no longer smells. 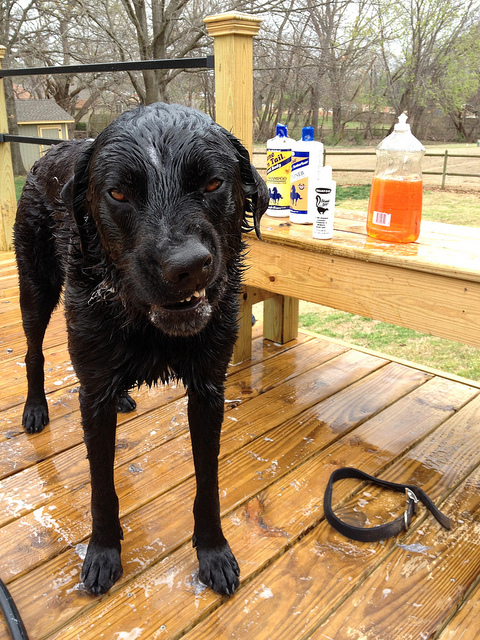 Finish up with an overall shampooing using your normal dog shampoo, rinse and dry him off. Discard any remaining mixture. Do not cover it or store it for later use. Several commercial products are available for removing skunk oil from your pet, but this mixture did an amazing job and most people already have hydrogen peroxide, baking soda and dish soap on hand. Since skunk attacks usually happen at night and you need to react quickly when they happen, I plan on restocking and keeping an extra amount of these supplies at home. I seriously hope it never happens again, but I would hate to have to make a late night run to the store while my dog is miserably waiting outside with skunk spray drying on her coat. Luckily, Haley didn’t get sprayed directly in the eyes and she didn’t seem nearly as stressed about the whole event as we were. As a matter of fact, after she was finished with her one hour de-skunking process, she ran to the window, sniffed the air, then looked at me as if to say “I think there’s an animal out in the yard!” Gee, I was hoping she had learned a little something about skunks! Now we’re just left with the remnants of what happens when a skunk sprays just outside your house and all your windows are open. Even though the dog is clean, the entire house has been given multiple smell tests, room sprays have been dispensed and scented candles still burn, there are still weird pockets of skunk aroma that tend to form in different areas of the house, then dissipate, then form again somewhere else. It wasn’t the most fun I’ve had staying up until 3:00 on a Sunday morning, but it turned out well in the end and hopefully all will be back to normal soon as this funky skunk spirit decides to leave us for good! Have you ever had to deal with a dog that got sprayed by a skunk? What worked for you? Oh geez, this is so valuable. Our dog Sally used to get skunked all the time when we lived near Griffith Park. This was back many years ago and the solution was the tomato juice bath…This is so helpful. Oh man, I can just picture Chewy running around freaking out if he ever got sprayed by a skunk. He rolled in some poop once, and he was all OMG GET IT OFFFFFF!! Thankfully, skunks don’t seem to hang out in our neighborhood. Hope your skunk smell remnants fade away real soon! That’s so funny about Chewy! You’re lucky he’s not the kind of dog that likes to roll in nasty smelling stuff. I think the skunk spirit aroma has finally left us, thank goodness! Yikes! We are always worried about the dogs getting sprayed when we let them out at night. I have heard that concoction works well. Yes, I’ve already restocked supplies in case it ever happens again. 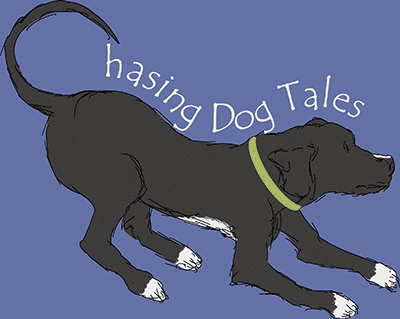 I really enjoyed checking out your blog and learning more about your hunting dogs! This is definitely going in my bookmarks – we haven’t had an encounter yet (luckily) but I see enough skunks around to know it’s probably just a matter of time. Some of the commercial skunk scent removers are really good too, but they all need to be applied right away. Once the oil dries on their fur and skin, you mostly have to live with the odor which can take quite a long time to go away. Good luck! Tonight my female brit was sprayed for the third time this summer and my male lab for the first. Every time they get the least bit wet now, the lovely scent will return for a visit. FOR MONTHS!!!! Why is it that my dogs remember the Vet’s office as bad, but don’t remember to stay away from the thing that sprays them with that vile stench? And they’re noses are a bazillion times more sensitive than ours. OK rant is done. I’m so sorry, Susan! Really, I feel your pain and join in your rant. It must be a bad year for skunks or something because we’ve had a lot of them hanging around our house and Haley got sprayed again a few weeks ago. I thought the same thing about the dog’s sense of smell, you would think the horrible odor would be so strong and bother them a lot but they really don’t seem to mind it that much. This time I used Nature’s Miracle Skunk Odor Remover which worked really well too and first thing the following morning I was at PetSmart buying another bottle just in case it happens again, lol. I decided to research skunks after this second spraying and I think our problem might be grubs in our yard, which skunks eat. We’ve noticed some areas in the yard where the grass is dug up a little bit from them looking for grubs. We treated the yard so hopefully they’ll move on. We use regular dog shampoo and apple cider vinegar. Then let him dry. Works perfectly. Thanks for that tip, Ashley! Apple cider vinegar is good for so many things, I’ll have to try that combination if Haley ever gets sprayed again. Do you mix the two together or use the vinegar first then follow up with the shampoo? These comments were all very useful. Thank you. My dog got sprayed last night and I did the peroxide, dish soap and baking soda.i used random proportions since the dog was already in the tub when I found the recipe, so I was rushed. My question…since nobody else in the family dealt with it till I got home, how do I get the smell off carpet, and beds? Both times that Haley got sprayed, she didn’t lay on any furniture and we could never find any areas of carpet that smelled strong but the skunk odor remained in the house for a few days. It was so odd that certain rooms had a strong smell even though she never even entered those rooms and sometimes just walking through the house, you would hit these pockets of strong skunk odor that would then be gone minutes later. I’m hoping that’s what’s happening in your house and in a day or two you might not notice it any longer.